How to Dry Sage | Grow This! Sage is one of the easiest herbs to grow at home and does wonderful things to all kinds of culinary dishes, especially meats like duck and pork. 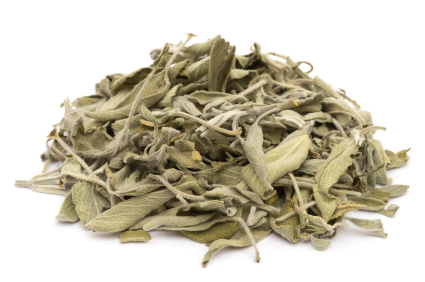 Sage is one of the rare herbs whose flavor actually improves after drying. Here are some tips on how to dry sage. While sage can be harvested throughout the growing season, the leaves have the most flavor just before the plant goes to flower. Harvest on a cool or overcast day when possible. This will help to limit wilting. Cut off entire stems or branches to be dried at once. Discard all yellow, dry or wilted leaves or anything that looks diseased, insect bitten or otherwise unhealthy. Wash the stems thoroughly in cool water. Use a cloth or paper towel to pat dry the stems as much as possible before proceeding. If you have a salad spinner, this is an easy way to discard excess water. Tie several bundles of stems together and hang to dry. For faster drying, include fewer branches per bundle. Sage tends to take longer than many herbs to dry due to its high oil content. Wrap a small paper bag around each bundle and poke holes and slits in it for ventilation. While the brown bag is not completely necessary it helps to ensure your sage dries safely and cleanly. Hang each bundle in a dry, dust free space. Avoid hanging them in the kitchen – the fragrance and smoke emitted from cooking can affect the flavor of the sage. Try a dry attic, garage or closet. Let sage dry for about two weeks or as long as needed. It should easily crumble to the touch. Place dried sage in an airtight container and store in a cool, dark place. Be sure to remove any moldy leaves before storing. You can store them whole or crush them down, discarding the stems. You can also save time by using a food dehydrator to dry your sage. Spread the sage stems loosely on a drying rack and put it in the front or on top of the machine. Do not dry different herbs together in this method or they will corrupt the flavor of each other. Another method is to dry sage in the oven on the lowest temperature. Place a piece of parchment on an oven tray or cookie sheet. Spread the sage leaves out and place in the oven. They should be dry within a couple hours, but best to check on them regularly to be sure they don’t burn. Don’t want to dry your own? Frontier Rubbed Sage Leaf comes in a 16 oz foil bag. If you use a lot of sage in your cooking or for other purposes, this is a great price for the amount of sage you get. These White Sage Smudge Sticks come in a set of two. They are 100% natural and gathered in an environmentally friendly way. Use for smudging, meditation, repelling mosquitos, and more.